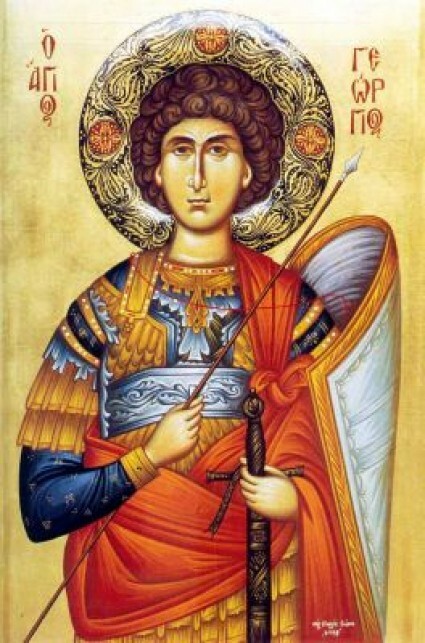 On the twenty-third of this month [April], we commemorate the Holy and Glorious Great Martyr George the Trophy-Bearer. Is gladly cut down of his foes by beheading. On the twenty-third, George’s neck was seized by the brazen blade. The glorious, wondrous and great Martyr of Christ George flourished during the reign of Emperor Diocletian (284-305), and was from the land of Cappadocia, of an illustrious and noble family. At first he shined in the order of tribune, and later when he was intending martyrdom he was either a commander, leader or general. When the impious Diocletian began a persecution against the Christians, he issued a royal decree which stated that all those Christians who denied Christ would be made worthy of royal honors, and those who refused to deny Him would receive the penalty of death. Thus when the emperor issued this atheistic order, then the great George presented himself, and proclaimed himself a Christian, and rebuked the delusion and weakness of idols, and mocked those who believed in them. Because the Saint was not persuaded by the flatteries and promises of the tyrant, nor his threats and boasts, but spurned them all, first they struck him in the stomach with a wooden pole. The wooden pole struck the flesh of the Saint to such an extent, that he began to bleed much, but the nose of the pole twisted back, wherefore the Saint remained unharmed. 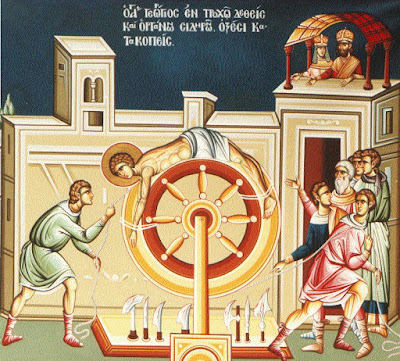 Then they tied him up to a wheel, to which was fastened sharp irons, and they let the wheel roll down a downward place, which cut the body of the Martyr in many pieces, but with the assistance of a divine Angel he was made whole and healthy again. Hence the Saint stood before Dioclatian and his co-ruler Magnentius, who at the time were making sacrifice to the idols, and because he appeared alive and well after his horrible torments, many Greeks were persuaded towards faith in Christ, and they were beheaded at the order of the emperor. Then the empress Alexandra embraced the faith of Christ, and confessed Christ as the true God before her husband Diocletian. Many others also believed in Christ, when they saw the Saint placed in a pit of quicklime, and he remained unharmed. After this they nailed the feet of the Saint to iron shoes, and they forced him to run. Then they beat him mercilessly with the dry sinews of an ox. Magnentius then asked the Saint for a sign, by raising one who was dead, who many years prior had died and was buried in a tomb, located in front of the Saint. Wherefore the Saint prayed on the surface of the tomb and, O the wonder! the dead man rose, and venerated the Saint, glorifying the divinity and power of Christ. When the emperor asked who he was and when he died, the dead man responded that he lived before the coming of Christ, and due to his delusion to the idols he was burning in fire for all those years. * His sacred remains were taken by his servant from Nicomedia to Palestine, to a town called Lydda, the homeland of his mother, and then were finally transferred to the church which was raised up in his name. (The translation of the Saint's holy relics to the church in Lydda is commemorated on November 3; Saint Alexandra the Empress on April 21.) 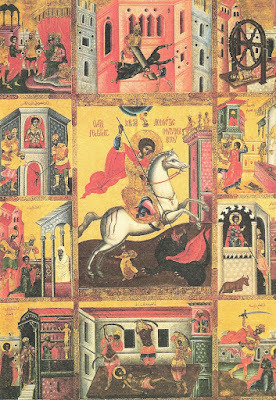 If April 23 falls on or before Great and Holy Pascha, the feast of Saint George is translated to Bright Monday. Liberator of captives, defender of the poor, physician of the sick, and champion of kings, O trophy-bearer, Great Martyr George, intercede with Christ God that our souls be saved. Cultivated by God, you became manifest as an honorable tiller gathering for yourself the sheaves of virtue. For you sowed with tears but reaped with gladness; in the contest you competed with your blood and came away with Christ. By your intercessions, O Holy One, all are granted forgiveness of sins.